Self-Storage St. Louis: Things Stored in Multiple Locations? 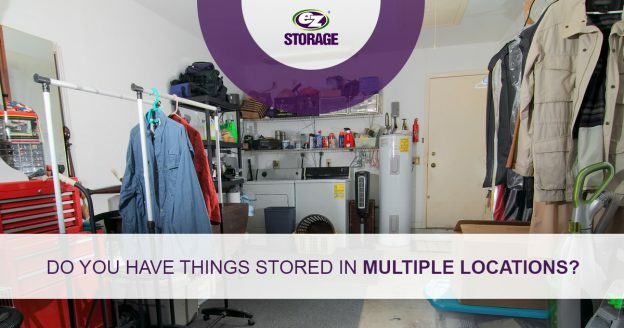 Do You Have Things Stored in Multiple Locations? When you first moved out of your parents’ house, you probably left some belongings behind, such as high school mementos, some clothes, and a few pieces of furniture. You took with you what you needed, but there were still boxes stored in the basement, the attic, or the garage. As you got older, you may have moved a few times, so you brought some more belongings to the house, or you stored things with friends or other family members. If you have things stored in multiple locations, then it can make sense to rent a self-storage unit and put it all in one place. At EZ Storage® in St. Louis, we can help you find the ideal space, and you won’t have to wonder what’s stored where! One of the disadvantages of having your belongings stored in more than one spot is that it can be hard to remember where things are. Objects from your childhood are likely at your parents’ house, but there may be a box or two that you took with you, but then stored somewhere else a few years later. If you’re looking for something specific, it can be frustrating to go to one place only to discover that the thing you want is somewhere else. With a storage unit, all of your boxes and furniture will be in one place, and you won’t have to drive all over town to find something. If you’ve moved a few times over the past few years, then you may have stored some things each time you relocated. Your friends or family were happy to take some things and keep them safe, but you still noticed that your stuff was taking up more and more space each time. Renting storage can make it more convenient for both you and your family or friends, since your things won’t be taking up valuable space in their house or garage. You’ll also be able to visit your storage space whenever you want, instead of having to coordinate with a friend or relative so that they’ll be home or that you have access to your belongings, should they be out of town. As you’re gathering your things from various places, it can be smart to take the opportunity to purge some of your belongings. You may have forgotten about some of the things that have been tucked away in boxes for several years, and once you see them, you might decide that you no longer need them. The same can be true of furniture that you’ve had stored for a long time — you’ve likely bought new furniture and no longer need to hold onto that couch you’ve had since college. At EZ Storage®, we’re here to make sure that your belongings are safe and sound for as long you need. If you have items in multiple places and you want to consolidate everything, then visit one of our facilities in the greater metro area today. This entry was posted in Self-Storage St. Louis and tagged affordable storage, self-storage, self-storage near me, self-storage units, storage near me, storage units on February 11, 2019 by admin.